The Blackville Soccer Club was recently provided a grant in the amount of $3,500 in support of the Learn to Play Soccer Project. This GO NB grant is provided through the Sport and Recreation Branch of the Department as part of the Cananda-New Brunswick Bilateral Agreement to Advance Sport Participation. The Province of New Brunswick is pleased to support initiatives that enhance sport development for children and youth as well as improve community sport and recreation. 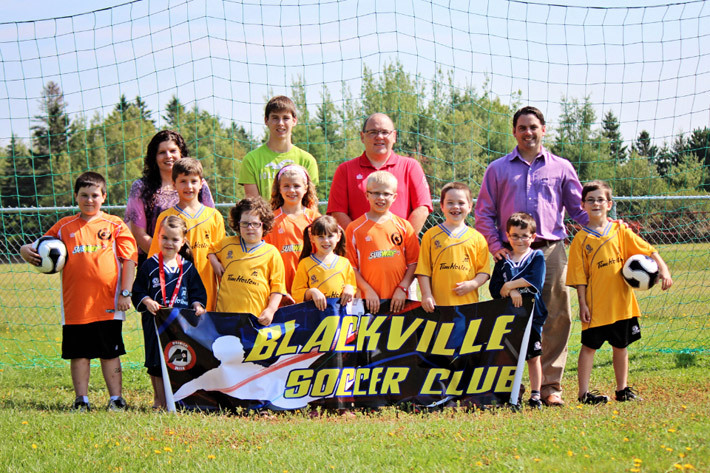 The Blackville Soccer Group registered 89 children this summer. Ages ranged from four to twelve years and the group is hoping to expand that next year to fourteen years of age. Jake Stewart, MLA for Southwest Miramichi, presented the group with the grant on Wednesday, August 21, 2013 to coordinators Edward Gilchrist and Melissa Curtis. Also present was volunteer coach Devan Brophy and some children who belong to the Blackville Soccer Group: Jaclyn Gilchrist, Derek Gilchrist, Andrew Walls, Ava Walls, Dakota Curtis, River Stewart, Roman Stewart, Coewan Munn, Sophie Munn and Blake Curtis.